Congratulations to Connie and Teri who each won a copy of the September/October 2018 issue of Quilting Quickly! Thanks to those of you who left comments answering the prompt, “Tell me what other fabric themes you could use when making this 2 1/2″ strip friendly quilt.” I loved reading your suggestions: Fall, Christmas, Patriotic, Valentine’s Day, Star Wars. Jennifer envisioned strips of lime green, turquoise, gray, black and white, while Brenda suggested gray, navy, teal, yellow and green for masculine flavor. Both Barb and Jane suggested cutting strips 2 1/2″ wide from stash and/or the leftover bin. What great ideas! I am anxious to begin making another “Simple Treats” as my Christmas bin is overflowing. 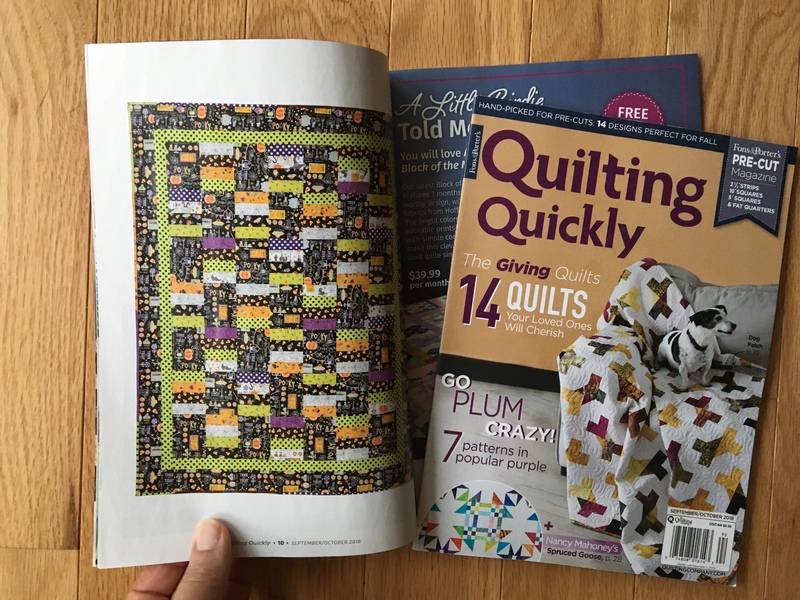 If you didn’t win a magazine this time and your newsstand has sold out, you can purchase a digital or print copy of Quilting Quickly from The Quilting Company’s online store. Aby, The Quilting Quickly magazine that I won has arrived and now I have added 9 (at the minimum) new quilts to my bucket list. And what a pleasant surprise to have it autographed with a special note. Thank you. You are welcome for the magazine, Connie. I am glad the quilts inspire you!